After a few days of heavy rain we have had a lovely day today, the sun was shining when I got up this morning - just the ticket to motivate me. And get some of that pesky washing dried! So I've been a busy little Bee. Our lovely neighbours have a Kiwifruit orchard, so at this time of year we are given loads of Kiwifruit. The girls love them but we can only get through so many. 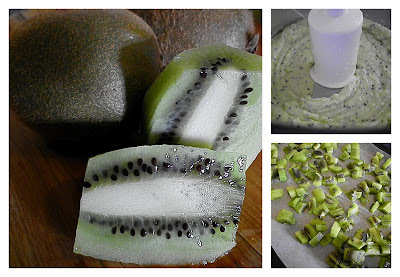 I usually try chutney or jam, as well as giving some fruit away but I found a recipe for Kiwifruit sorbet the other day that I just had to try. Easy to make too, just a few photos from the process. 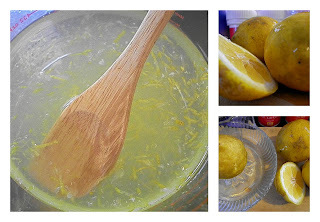 I made our favourite Lemon Cordial (recipe from NZ Gardener - can't find it online but you may be able to search for it) - really yummy. Do you remember the Macadamia harvest from last week? Well we put the Husker into operation and husked the lot of them within minutes, a job that used to take us hours!! 41Kg of nuts, all we have to do now is to dry them before we can crack them. We've made a few things with some that we cracked already, Sweet and Spicy nuts and Macadamia Cookies. I've also made a couple of new things today - Natural Vanilla Extract (made from Vodka and Vanilla Beans). The longer they are left the better the flavour is. I've heard of it lasting years, you just keep topping up the Vodka and replace the Vanilla when it breaks down too much. I didn't have enough Vodka left (its not a drink I really like, but I did use it in a couple of Summer cocktails), so will have to top it up more when I pick some up next time I go to town. And I also made some Witch Hazel Toner. My skin is a bit funny at the moment - I think it's from being stuck inside so much.... I hunted out a few of my natural remedies books and a good toner for skin prone to oily patches was made from Witch Hazel, water and Lavender. Mix together, store in a dark place and dab on cotton wool before using with the cleanse and tone routine. It's a long weekend here thanks to Queen's Birthday so I have the girls home tomorrow as well. I have a few ideas of what we could do tomorrow so watch this space. Have a great holiday today!! Wow that sorbet looks amazing!! And as for those cookies - I want them NOW. Just the thing to go with my cup of tea. Boy you have been busy - it all looks wonderful! Enjoy your holiday Monday hon. Cold and yuk here with fire going already!! Your blog is looking great. I used witchhazle all through my teens and had forgotten about it. The is a food loggers conference in October, email using adress off my blog if you want the details.